My iModeler Best in Show prize arrived…I’m so happy! I want to thank Martin and the rest of the judging team for picking my Hobby Boss Ka-29 “Helix-B” as the February award winner; I am still surprised that my model won. 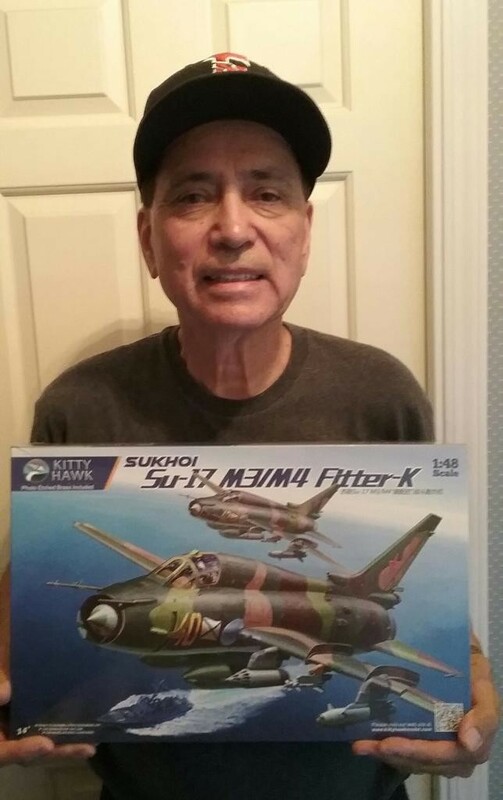 Martin provided me with a list of kits to choose from, from which I picked the Kitty Hawk Su-17 M3/M4 “Fitter K”. The kit arrived today, and it looks great. Thanks again for the award. 11 responses to My iModeler Best in Show prize arrived…I’m so happy! Congratulations, Marvin…a well deserved prize. I’d be curious to see what you think of the design and engineering aspects of that kit when it comes time start the assembling process. Take care and happy modeling, my friend. Congratulations Marvin !!!!! It’s a well deserved award. Your “Helix -B” was fantastic too !!!!! Well done, Marvin, I’m sure you’ll enjoy your prize. I’m looking forward to hearing about your experiences with the kit. Contemplating about buying one too. Thanks to all for the support…I appreciate it. This Kitty Hawk Su-17 kit has received some interesting reviews, especially since the recent release of the Hobby Boss Fitter in 1/48th scale. The inevitable comparison has almost reached the level of the “fake news” hysteria from another section of the newspaper (but I won’t go there). Having now had the change to see and feel both of the kits up close, I have to give the nod to the Kitty Hawk kit, simply based on level-of-detail, and also the huge amount of Soviet-era weapons included in the box. Basically, if it isn’t in there, it doesn’t exist. Of course, most of these parts will go in the bi, because you can only hang so much of those weapons on th six hard points. Still, now I have enough Soviet-era air-dropped weapons to last forever. Of course, the proof is always in the pudding, so the real test will come when plastic starts to get assembled. Thanks again, Martin. Congrats! I look forward to seeing it all built up. Congratulations! Enjoy the building and it will be great to follow the progress again. Well deserved prize, curious to see it on his leg.